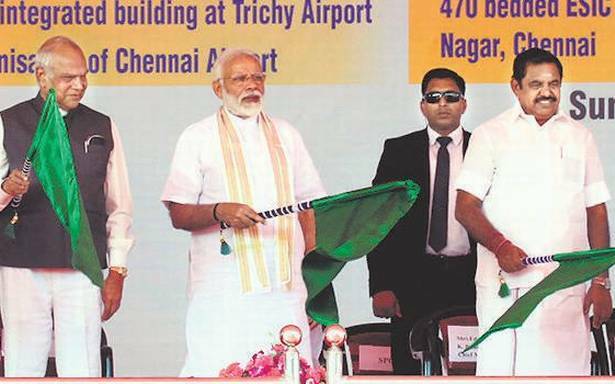 PM Shri Narendra Modi flagging off the final stretch of the phase-I of Chennai Metro Rail from Washermanpet to Teynampet DMS in Chennai over video conference facility from Tirupur. Chennai, Metro Rail News: Prime Minister Shri Narendra Modi inaugurated the last stretch of the first phase of 45-km Chennai Metro rail network through video-conferencing from Tiruppur in Tamil Nadu. The Last stretch of the Chennai Metro Rail Project from AG-DMS to Washermenpet of 10 kms has been completed and was inaugurated by the Hon’ble Prime Minister of India, Shri. Narendra Modi and the Hon’ble Chief Minister of Tamil Nadu, Shri. Edappadi K Palaniswami via video conferencing at Thiruppur, Tamil Nadu on 10.02.019 in the august presence of the Governor of Tamil Nadu, Thiru Banwarilal Purohit, Deputy Chief Minister of Tamil Nadu, Shri. O.Panneerselvam and other dignitaries participated at the event. At Chennai Central Metro Station, Hon’ble Union Minister (Independent Incharge), Thiru Hardeep Singh Puri, Ministry of Housing and Urban Affairs, Hon’ble Minister for Fisheries, Personnel and Administrative Reforms, Thiru. D.Jayakumar, Minister for Social Welfare, Dr. V. Saroja, Hon’ble Minister for Industries, Thiru. M.C.Sampath. participated in the video conference function and undertook a metro ride post inauguration from Chennai Central to AG-DMS via Washermenpet. In this function and the metro ride, Consul General of Japan Thiru Kojiro Uchiyama , Chief Representative ,JICA India Thiru Katsuo Matsumoto, Members of Parliament Thiru S.R. Vijayakumar, Thiru T.G.Venkatesh Babu, Dr. J. Jayavardhan and Additional Chief Secretary to Government, Special Initiatives Department, Dr.T.V.Somanathan, I.A.S, OSD(UT), Ex.Officio Jt. Secretary MOHUA, Thiru Mukund Kumar Sinha, Director (Systems & Operations), Thiru L. Narasim Prasad, Director (Finance), Tmt. Sujatha Jayaraj, Director (Projects). Thiru Rajeev Narayan Dwivedi also participated. The Metro cross through some of the densely populated areas in the city and with the inauguration of the new line, one can travel from Chennai Central to Airport in about 30 minutes. The metro will also connect the northern part of the city, considered undeveloped, with other parts of the city through Metro Rail enabling thousands of people from the area to enjoy a comfortable ride. The project was executed by the Govt of India and Tamil Nadu Government with assistance from the Japan International Cooperation Agency (JICA). With the Phase-I over, the focus has now shifted to Phase-II which expect to connect another 100-km through the new age transport system. The Phase-II is expected to connect the IT corridor, residential areas of the city and suburbs like Poonnamalle and Tambaram.